While looking through a vintage magazine, I came across a cute little lace motif that reminded me of leaves. Rather than using a magnifying glass and trying to re-create the leaves, I chose to grab a hook and just wing it from memory. The resulting swatch wasn’t the leaf motif from the magazine, but it was interesting in another way. I decided to write it down and put the swatch aside for a few days. When I picked it back up, I decided it would be worthy of a pattern. The resulting motif reminded me of an art deco building so I have been calling it “Deco”. The more I work with it, the more I’m seeing it morph into miniature Daleks from the popular Dr. Who series. I guess that is to be expected since the Daleks were designed with architecture from the art deco period. So, whether you are a Dr. Who fan or not, this simple pattern will keep you entertained without becoming too boring. 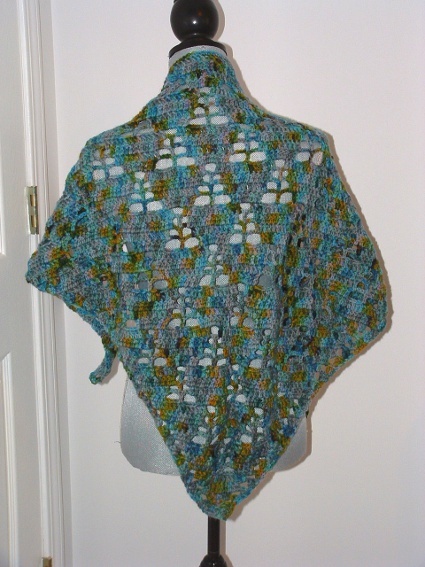 The shawl can be made to any size with any hook and yarn combination. 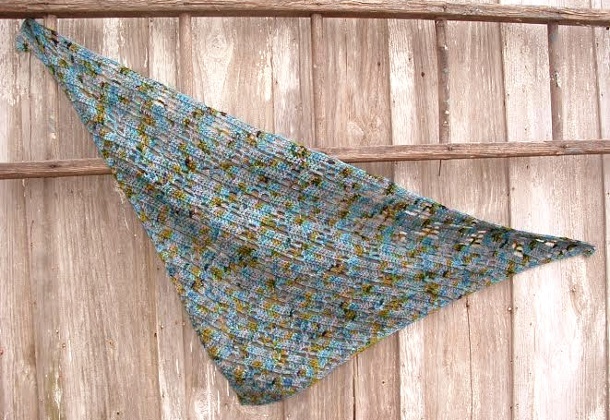 The sample shown used 450 yards of worsted weight yarn dyed by Interlacements and a size J hook. Gauge: Gauge is not significant in this design, just choose a hook and yarn combo that you like! Notes: This pattern can be done to any size with any hook and yarn combination. Blocking is optional. Foundation: Ch 4, make 2 dc in 4th ch from hook, turn. Row 1: Ch 3; make 2 dc in same st, sk 1 st, make 3 dc in top of turning ch. Row 2: Ch 3; make 2 dc in same st, ch 2, dc in notch between the two sets of dc of previous row, ch 2, make 3 dc in last st.
Row 3: Ch 3; make 2 dc in same st. Ch 2, make 2 dc in ch-2 sp, dc in next st, make 2 dc in ch-2 sp. Ch 2, make 3 dc in last st.
Row 4: Ch 3; make 2 dc in same st, ch 2, make 2 dc in ch-2 sp. Dc in next 5 sts, make 2 dc in ch-2 sp, ch 2, make 3 dc in last st.
Row 5: Ch 3; make 2 dc in same st, ch 2, make 2 dc in ch-2 sp. Dc in next 9 sts, make 2 dc in ch-2 sp, ch 2, make 3 dc in last st.
Row 6: Ch 3; make 2 dc in same st, ch 2, make 2 dc in ch-2 sp. Dc in next 2 sts, ch 4, sk 4 sts, dc in next st, ch 4, sk 4 sts. Dc in next 2 sts, make 2 dc in ch-2 sp, ch 2, make 3 dc in last st.
Row 7: Ch 3; make 2 dc in same st, ch 2, make 2 dc in ch-2 sp, dc in next 4 sts. Dc in ch-4 sp, ch 3, dc in next st, ch 3, dc in ch-4 sp, dc in next 4 sts. Make 2 dc in ch-2 sp, ch 2, make 3 dc in last st.
Row 8: Ch 3; make 2 dc in same st, ch 2, make 2 dc in ch-2 sp, dc in next 7 sts. Dc in ch-3 sp, ch 2, dc in next st, ch 2, dc in ch-3 sp, dc in next 7 sts. Make 2 dc in ch-2 sp, ch 2, make 3 dc in last st.
Row 9: Ch 3; make 2 dc in same st, ch 2, make 2 dc in ch-2 sp, dc in next 10 sts. Dc in ch-2 sp, ch 3, sk 1 st, dc in ch-2 sp, dc in next 10 sts. Make 2 dc in ch-2 sp, ch 2, make 3 dc in last st.
Row 10: Ch 3; make 2 dc in same st, ch 2, make 2 dc in ch-2 sp, dc in next 2 sts. Ch 4, sk 4 sts, dc in next st, ch 4, sk 4 sts, dc in next 2 sts. Make 3 dc in ch-3 sp, dc in next 2 sts, ch 4, sk 4 sts, dc in next st, ch 4, sk 4 sts, dc in next 2 sts. Make 2 dc in ch-2 sp, ch 2, make 3 dc in last st.
Row 11: Ch 3; make 2 dc in same st, ch 2, make 2 dc in ch-2 sp, dc in next 4 sts. Dc in ch-4 sp, ch 3, dc in next st, ch 3, dc in ch-4 sp, dc in next 7 sts. Dc in ch-4 sp, ch 3, dc in next st, ch 3, dc in ch-4 sts, dc in next 2 sts, make 2 dc in ch-2 sp, ch 2, make 3 dc in last st.
Row 12: Ch 3; make 2 dc in same st, ch 2, make 2 dc in ch-2 sp, dc in next 7 sts, Dc in ch-3 sp, ch 2, dc in next st, ch 2, dc in ch-3 sp, dc in next 9 sts, dc in ch-3 sp, ch 2, dc in next st, ch 2, dc in ch-3 sp, dc in next 7 sts, make 2 dc in ch-2 sp, ch 2, make 3 dc in last st.
Row 13: Ch 3; make 2 dc in same st, ch 2, make 2 dc in ch-2 sp, dc in next 10 sts. Dc in ch-2 sp, ch 3, sk 1 st, dc in ch-2 sp, dc in next 11 sts, dc in ch 2 sp, ch 3, sk 1 st, dc in ch-2 sp, dc in next 10 sts. Dc in ch-2 sp, ch 2, make 3 dc in last st.
Row 14: Ch 3; make 2 dc in same st, ch 2, make 2 dc in ch-2 sp. (Dc in next 2 sts, ch 4, sk 4 sts, dc in next st, ch 4, sk 4 sts, dc in next 2 sts, make 3 dc in ch-3 sp) 2 times. Dc in next 2 sts, ch 4, sk 4 sts, dc in next st, ch 4, sk 4 sts, dc in next 2 sts, make 2 dc in ch-2 sp, ch 2, make 3 dc in last st.
Row 15: Ch 3; make 2 dc in same st, ch 2, make 2 dc in ch-2 sp, dc in next 4 sts. (Dc in ch-4 sp, ch 3, dc in next st, ch 3, dc in ch-4 sp, dc in next 7 sts, dc in ch-4 sp) 2 times. Ch 3, dc in next st, ch 3, dc in ch-4 sp, dc in next 4 sts, make 2 dc in ch-2 sp, ch 2, make 3 dc in last st.
Row 16: Ch 3; make 2 dc in same st, ch 2, make 2 dc in ch-2 sp, dc in next 7 sts. (Dc in ch-3 sp, ch 2, dc in next st, ch 2, dc in ch-3 sp, dc in next 9 sts) 2 times. Dc in ch-3 sp, ch 2, dc in next st, ch 2, dc in ch-3 sp, dc in next 7 sts. Make 2 dc in ch-2 sp, ch 2, make 3 dc in last st.
Row 17: Ch 3; make 2 dc in same st, ch 2, make 2 dc in ch-2 sp, dc in next 10 sts. (Dc in ch-2 sp, ch 3, sk 1 st, dc in ch-2 sp, dc in next 11 sts) 2 times. Dc in ch-2 sp, ch 3, sk 1 st, dc in ch-2 sp, dc in next 10 sts. Make 2 dc in ch-2 sp, ch 2, make 3 dc in last st.
Repeat Rows 14-17 for pattern until desired size. Working a few rows of single crochet across the top edge for stabilization. Fasten off and weave in ends. Block to desired shape.Fasten off and weave in ends. 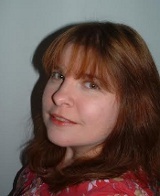 Cheri is a stay at home mother and wife. She has been designing knit and crochet patterns for about 5 years as a way of maintaining her sanity. She is an avid science fiction and crime drama aficionado and often pulls details from these genres into her pattern designs. Lovely! Thank you! Hope to try it soon…still a newbie at crochet. I am having a lot of trouble with row 14. I feel like there is a stretch of ‘dc in the next 7 stitches’ missing just before the last ‘make 2dc in ch-2 space’. I’m on my first repeat of this row and this is the second time I’ve had extra stitches in this row. Please help. I LOVE this pattern so far but I’m still a newbie so it isn’t impossible that I’m doing something wrong.